For some people, the urge for suicide comes with a flare for the dramatic. In the case of one woman from Buenos Aires, Argentina, she decided that she wanted to make a splash and leap from the top of the iconic Hotel Crown Plaza Panamericano. Well, a splat anyway. Unfortunately for her, she survived her 23-story fall. The unnamed 30-year-old suicide jumper fell 23 stories and survived with only broken ribs, broken hips, and internal bleeding; she’s beaten up but she’s still alive, which is amazing. Like previous suicide survivors, this woman survived thanks to landing on a car. It beats landing on a pile of uncollected, weeks-old garbage! Amazingly, the woman survived when she landed on top of a taxi cab driven by Miguel Cajal. He stopped only because he saw the commotion in front of the Crown Plaza Panamericano and saw a police officer pointing up wards. 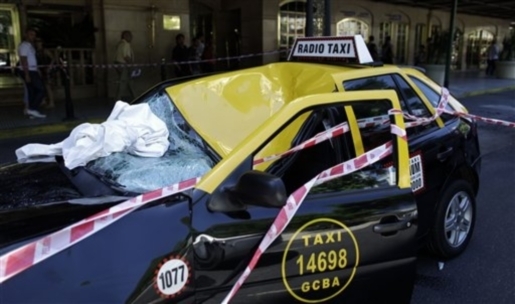 He got out of his cab and bang, a woman landed right on top of it in a seated position. Somehow, she survived her 330-foot (100 meter) plunge from the edge of the building.